Head office is in Basel, Switzerland and representative offices in Hong Kong SAR and in Mexico City. 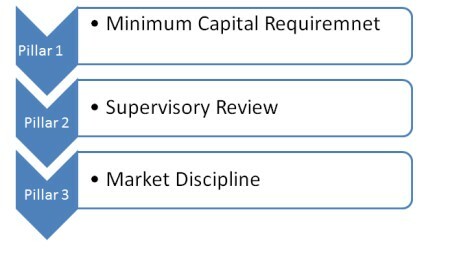 BCBS is termed as Basel Committee on Banking Supervision . To ensure that banks operate in a safe and sound manner. To ensure that banks "hold capital and reserves sufficient to support the risks that arise in their business". Capital Adequacy provides regulators with a means of establishing whether banks and other financial institutions have sufficient capital to keep them out of difficulties. Regulators use a Capital Adequacy Ratio (CAR) to assess risk . Expressed as a percentage of a bank's risk weighted credit exposures. Also known as “ Capital to Risk Weighted Assets Ratio (CRAR)” . Ratio is used to protect depositors and promote the stability and efficiency of financial systems around the world. While bank’s assets (loans & Investments) are risky and prone to losses, its liability (deposits) are certain. Assets = External Liabilities + Capital Liabilities (deposits) are to be honoured. Hence, reduction In Capital. When Capital is wiped out – Bank Fails. The breakdown of the Bretton Woods system of managed exchange rates in 1973 soon led to casualties . On 26 June 1974, West Germany's Federal Banking Supervisory Office withdrew Bankhaus Herstatt's banking licence after finding that the bank's foreign exchange exposures amounted to three times its capital. Basel Committee on Banking Supervision [BCBS] was established by the central-bank governors of the G10 countries in 1974. Its objective was to enhance understanding of key supervisory issues and improve the quality of banking supervision worldwide. In 1997, developed a set of "Core Principles for Effective Banking Supervision", which provides a comprehensive blueprint for an effective supervisory system. Later renamed as the Basel Committee on Banking Supervision. The Committee was designed as a forum for regular cooperation between its member countries on banking supervisory matters. Its aim was and is to enhance financial stability by improving supervisory know how and the quality of banking supervision worldwide. By setting minimum supervisory standards. By improving the effectiveness of techniques for supervising international banking business. By exchanging information on national supervisory arrangements. And, to engage with the challenges presented by diversified financial conglomerates. The Committee also works with other standard-setting bodies, including those of the securities and insurance industries. The Committee's decisions have no legal force . Rather, the Committee formulates supervisory standards and guidelines and recommends statements of best practice in the expectation that individual national authorities will implement them. In this way, the Committee encourages convergence towards common standards and monitors their implementation, but without attempting detailed harmonisation of member countries' supervisory approaches. No foreign banking establishment would escape supervision. That supervision would be adequate and consistent across member jurisdictions. 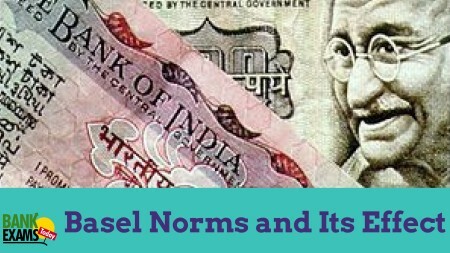 In 1988, the Basel Committee (BCBS) in Basel, Switzerland, published a set of minimal capital requirements for banks, known as 1988 Basel Accord or Basel 1. 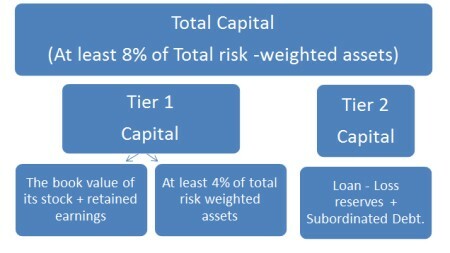 Assets of banks were classified and grouped in five categories to credit risk weights of zero ‘0’, 10, 20, 50 and up to 100%. Assets like cash and coins usually have zero risk weight, while unsecured loans might have a risk weight of 100%. To set up a fair and consistent international banking system in order to decrease competitive inequality among international banks. Tier I (Core Capital) : Tier I capital includes stock issues (or share holder equity) and declared reserves, such as loan loss reserves set aside to cushion future losses or for smoothing out income variation. Tier II (Supplementary Capital) : Tier II Capital includes all other capital such as gains on investment assets, long term debt with maturity greater than 5 years and hidden reserves. However, short-term are not included. According to Basel I, the total capital should represent at least 8% of the bank’s credit risk. The G-20 endorsed the new ‘Basel 3’ capital and liquidity requirement as remedy to overcome financial crisis of 2008-2009. Places greater emphasis on loss-absorbency capacity on a going concern basis. Presently PSU banks carry adequate CAR. Over next few years, Tier I Capital specially Equity Shares will be of prime importance instead of CAR. Public Sector Banks need Rs. 4.15 trillion additionally to meet the requirement – Rs. 2.72 trillion for non-equity capital and approx Rs. 1.43 trillion for equity capital over a period . Government to recapitalize an estimated Rs. 900 billion at existing stake holding position or Rs. 660 billion if reduce its shareholding down to 51% . Some public sector banks are likely to fall short of the revised core capital adequacy requirement . Increase in requirement of capital will affect the ROE of the public banks.